September 17th, 2006: Cold, windy, and non-stop rain or drizzle. We’re not used to this! At least we haven’t had any snow (yet!). I wonder how the hunters are making out in the bush? Cold, wet and miserable, and having the time of their lives, I’ll bet. My combining career came to a crashing halt last Wednesday. I came home on Monday to visit with friends and relatives Bill and Pearl Bowley, from Moose jaw. While I was gone, Dan and Bryan did some canola, but found it a bit tough. I went back on Tuesday and with help from Craig Gudmundson and his combine we cleaned up all the wheat and barley that was ready. Good thing, too, because it rained during the night. Not much, but enough to put a stop to harvesting. So, I came home. I doubt if they will need me again this fall. At Archerwill it started raining, very hard at times. That night, we got about a half inch. On Thursday we left for Saskatoon and it rained hard from about noon on. We came home Friday and it had never quit raining, plus very strong winds. What you might call a horizontal rain. I’m sure Saskatoon really got a bucketful. On our gauge at home there was an inch more than when we left. It finally quit for awhile, but started up again later in the evening and continued all day Saturday. By this morning, our old gauge, a columnar type, was over the top and it is graduated up to five inches. I estimated 5¼ inches when I dumped it. Our new gauge, an electronic one courtesy of Raelynn and Kelly Chase, read about two thirds of an inch less. Since it is a few feet farther from the house I tend to believe it to be more accurate. Anyway, you could safely say we have had five inches of rain in September, most of it in the past four days. Brian Shuya, on the other hand, says he recorded over six inches of rain just in the past few days, as have others who live near him. I heard, too, of seven inches or more in Porcupine Plain. That’s a lot of water! The creek is running hard, the Red Deer River too. The floating dock at the Marina is level with the fixed dock so we are getting close to another peak in the lake level. That will be three times this year! I drove down to the marina yesterday. Burl Adams was pumping the water out of his boat; it had a partial top so hadn’t sunk but the two boats beside him had their back ends under water. 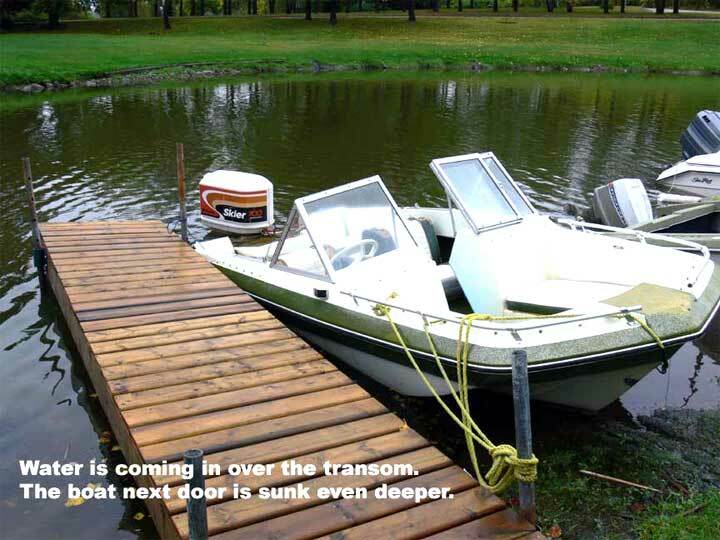 They caught the rain over their full surfaces, it ran to the back as the fronts were pulled up on shore, and soon the lake was coming over the transom. Quite a job to get them bailed out and I’m not sure what the water will do to the battery. We are rapidly approaching a time for change. We find we are no longer interested in maintaining a house and yard. Much as we love winter, blowing snow is a good job for someone else. We want to be free to take off for a day, a week, or a month without having to arrange for someone to check the house or clear the driveway. Five years ago, I kept the driveway, plus the neighbours’, clear with a shovel. Now I have a snowblower but it plays me out just pulling on the rope. I can’t even remember how to use a shovel, and don’t want to re-learn. So, we will likely be putting our place up for sale before long. The two things that bother me most about leaving here are coffee row, and the Greenwater Report. I will likely try to continue writing, but will I find anything interesting to write about living in the city? Will anyone want to read it? Will the papers still want to run it? More on this developing mystery as time goes on. Watch this space. I have the latest information on the Cove’s plans for this fall. I talked to Sabrina this morning, and she said they were converting the store into a combination store and small café, with about ten tables. They will serve light lunches and beverages, and sell gas and staples such as milk, bread and canned goods. The rooms and cabins will be shut down for awhile for refurbishing, so the only door into the Cove will be the store door. Sounds like a good plan – they can cut costs during the slow months but still provide basic services, and the new café should be nice and cozy. Changes will take place October first. Ryan Gustus’s beautiful rustic furniture will no longer be on display, but he is taking it to a major show this fall in Regina anyway. If you haven’t seen Ryann’s furniture, you have been missing out. It is gorgeous! I just learned of the death of Brian Thirsk, who used to own a cottage in Uskatik and later a trailer in Almi Campground. Brian died yesterday. There is a charity golf tournament scheduled for next weekend at Willows Golf Club in Saskatoon. If you are interested, contact Joyce Chase-Weber at 934-5044 or e-mail her at jchaseweber@shaw.ca.